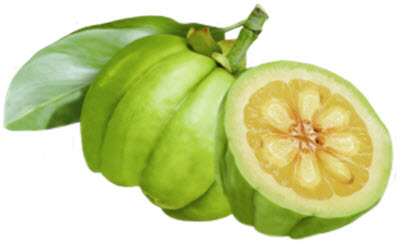 Garcinia cambogia is the former scientific name of the species Garcinia gummi-gutta. It’s a tropical fruit tree native to Indonesia, but is cultivated in numerous other countries due to its desirable fruit. The species has many different common names, such as Brindleberry, Malabar tamarind and Pot tamarind. The old scientific name Garcinia cambogia is also used in many texts. The fruit has a thin skin and deep vertical lobes. The lobes gives it a bit of pumpkin-like appearance. The size ranges from orange to grapefruit. The colour is yellowish, greenish or reddish. The hydroxycitric acid is extracted and included in certain dietary supplements. Garcinia cambogia is chiefly grown in South-East Asia, along the Indian west coast, and in western and central Africa. It prefers a humid forest environment. Garcinia cambogia is used in various ways. Many traditional recipes from its native area and nearby regions call for rinds or extract from the Garcinia cambogia fruit; it is for instance included as a condiment in numerous curries. Along the western coast of India, the fruit is consumed in the same way as tamarinds, and it is even referred to as Malabar tamarind. In the southern Thai version of the dish kaeng som, the fruit is necessary as a souring agent. In the Ayurvedic tradition, the sour flavour of the fruit is believed to aid digestion. If the fruit is laid out to dry in the sun, it will shrivel up and turn dark brown or black. This is a traditional method for preserving the fruit longer. Dietary supplements containing Garcinia cambogia extract, or just the hydroxycitric acid, are heavily promoted as weight loss supplements. There is no clinical evidence for their alleged effectiveness. One of the most well-known promoters of Garcinia cambogia extract as a weight loss aid is the Turkish-American TV-personality Mehmet Cengiz Öz, commonly known as Dr. Oz. The fruit or extracts derived from it may interfere with certain drugs, including some used to treat asthma, diabetes or blood-clots. A 2011 meta-analysis1 showed that adverse gastrointestinal events were two-fold more common with the extract than with placebo. 1Onakpoya, Igho; Hung, Shao Kang; Perry, Rachel; Wider, Barbara; Ernst, Edzard (2011). “The Use of Garcinia Extract (Hydroxycitric Acid) as a Weight loss Supplement: A Systematic Review and Meta-Analysis of Randomised Clinical Trials”. Journal of Obesity. 2011 (December 14): 509038. doi:10.1155/2011/509038. PMC 3010674. PMID 21197150.